The culture of modern video games, in which I’m as hopelessly embedded as the culture of literature, has a special affinity for broken translations. Since so many of the great games from the 1980s and ’90s were made in Japan—and because the industry wasn’t particularly well respected during that era, leaving North American localization a bit of an afterthought—linguistic miscues and absurdities were fairly prevalent. All too often this resulted in muddled themes, unclear motivations, and unintentionally hilarious dialog. This was but one of many growing pains for an industry in the nascent stages of an upward trajectory that, today, has earned it an influence rivaled only by Hollywood. Games like Final Fantasy VII, Metal Gear, and most famously, Zero Wing, show the medium’s first big missteps in the minefield of translation. Nowadays, at least, we can reflect on those errors fondly, even endearingly, and laugh at the silliness of what emerged from this tentative overlapping of culture and language. The missteps of literary translation can extend far beyond unintentional humor, however. In fact, as Aviya Kushner argues to great effect in her new book, The Grammar of God, the cumulative decisions of translators across many centuries have dramatically altered how we, today, experience one of the most important and influential books ever written: The Bible. In a thorough, obsessively detailed comparison of the English and Hebrew versions of The Bible, Kushner offers a fascinating and intimate analysis of how the intricacies of language can profoundly impact even the most cherished of our beliefs. At times, the differences are slight, almost comical. The original Hebrew, Kushner reveals, does not tell us to honor our parents, but rather to treat them “with heft” and “heavy consideration.” The King James translation captures the spirit of the original, but alters the tone of the commandment quite a bit (it is difficult to imagine my mother, for instance, opining that her children don’t consider her as heavily as she’d like). 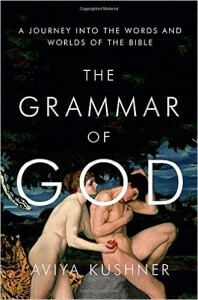 Elsewhere however, similarly minor tension between the Hebrew and English suggests, perhaps, the need for a reinterpretation of The Bible’s basic cosmology, as with the question of whether Genesis begins with a simple sentence (“In the beginning, God created the heavens and the earth.”) or a compound sentence (“At the beginning of God’s creating of the heavens and the earth,”). That little dot at the end—period or comma?—has untold ramifications. More often than not, however, the differences in translation primarily affect how one experiences The Bible, in a personal and internal way. Kushner’s book is itself quite personal, frequently blending in memoir and family anecdotes, and is far better for it. The Bible is, after all, a deeply personal book for most people. And although one of the main lessons of Kushner’s investigation is that there is more distance and artifice between the original Bible and its modern reader than many would care to admit, she has done a wonderful job of capturing the passionate complexity of the process that has led us here. The history of the Bible’s many translations is in many ways a history of the people who devoted themselves so genuinely to the text. And it matters that what is described is not simply the water but the riverbank, the edge of water, the border between water and land. It matters that what happens later in the psalm is almost an expression of complete doubt, and almost an expression of complete faith. The language of the psalm is about borders, and at every turn it mirrors the distance between the Psalmist and what he most wants. Here, yet again, language itself—diction, syntax, verb conjugation—is the means through which an understanding of, and emotional connection with, God is achieved. It is how we aspire to the divine. Kushner spends many pages discussing the metaphor of the deer, and the resulting chapter is a perfect microcosm of the entire book: it seamlessly blends a personal narrative of leaving her home town for Manhattan as a teenager, a concise history of the various translations of Psalm 42, unapologetically pedantic analysis of grammar, and insightful commentary on how the complex deliberations of The Bible reflect something basic in humanity. All of that from an unassuming little deer, and the question of whether what it craves is merely water—sustenance—or the transformation promised by the water’s edge. It is an eternal sentiment, a deeply human sentiment, because being human is about having limits, about not being able to reach all we want to reach. Being human is about craving. It is, at its essence, a state of thirst. This thirst is a driving motivation in Kushner’s work. Her book does not pass judgment on mistakes made, nor does it demand that we fundamentally alter our perception of holy documents. It merely seeks a more complete understanding of this foundational element of cultural history, self-assured in its conviction that the pursuit of knowledge is itself a means of transformation, a path—circuitous, perhaps—that seeks as its end communion with that which we cannot quite explain. Kushner understands and respects that translation is often a labor of love. But it is also a delicate and precise transaction with high stakes. A poorly chosen word, oddly constructed verb phrase, or lack of dedication to what we vaguely call the “music” of language, and the translator risks betraying the spirit of the source material. Those who enjoy the original will be upset; readers of the new version will be disappointed. To not only analyze these stakes, but to choose as its source such an important and meaningful work as The Bible, makes The Grammar of God an ambitious book. That Kushner delights just as frequently as she informs, celebrates language as frequently as she scrutinizes it, makes it a great one.